From the eastern plains to the western mountains, the landscape of Colorado supports a diverse community of native flowers. These flowers have adapted to the climate and conditions in which they grow and when planted in the home garden, they require less water and fertilizer than many non-native species. Gardeners can choose plants appropriate for their elevation and climate to create a sustainable, native landscape. 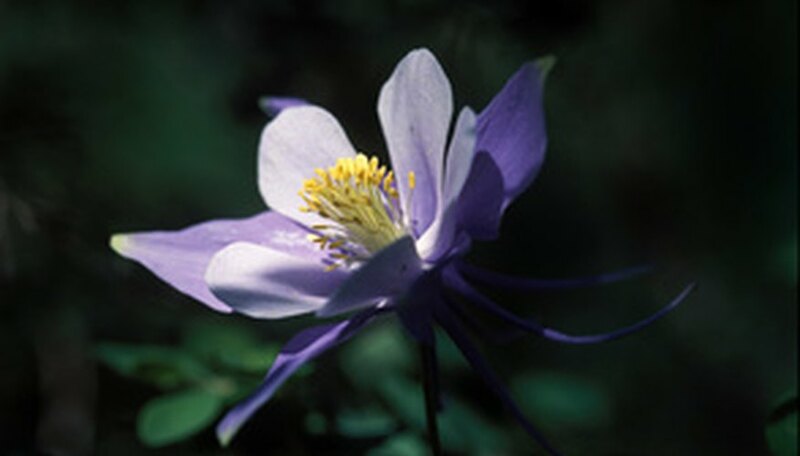 Colorado columbine (Aquilegia caerulea) grows between 12 and 36 inches tall in elevations up to 11,000 feet. The branched stems bear 1-inch long, lobed leaves and bell-shaped flowers that attract hummingbirds. The flowers feature white petals surrounded by bluish purple sepals and a cluster of yellow stamens in the center. The flowers bloom in spring and summer. In the fall, the foliage may turn red. Native to meadows and open woodlands, Colorado columbine prefers fertile, well-drained soil, partial shade and moderate moisture. Powdery mildew and rust diseases may affect columbines during very dry weather. Remove infected foliage, increase air circulation and clean up fallen foliage at the first signs of disease. The tubular, red flowers of scarlet bugler penstemon (Penstemon barbatus) grow along tall stems in summer, reaching up to 36 inches tall. The lance-shaped leaves grow 8 inches long in clusters at the base of the plant. Native to mountainous areas of Colorado, scarlet bugler penstemon performs best in elevations up to 9,000 feet in light, well-drained soil and full sun. This perennial enjoys dry conditions and rarely needs additional water. Prevent snails and slugs from damaging young plants by regularly removing weeds and fallen leaves. Pasque flower (Pulsatilla patens) grows wild in alpine meadows in Colorado. The hairy, erect stems grow to 12 inches tall and hold cup-shaped violet, yellow or white flowers with yellow stamens in the spring. The woolly foliage is divided into multiple segments, giving it a fern-like appearance. Silky, white seedheads replace the flowers in summer. Pasque flower grows in elevations up to 9,000 feet in full sun and fertile, well-drained soil. It requires little supplemental water and has no serious pest or disease problems but is sensitive to disturbance. Plant young plants in an area of the garden that will remain undisturbed to prevent damage. The clump-forming perennial Aspen daisy (Erigeron speciosus) grows in elevations under 9,500 feet. The summer months bring blooms of daisy-like lavender flowers with yellow centers. Fringed, lance-shaped leaves,up to 6 inches long grow from the 12- to 18-inch tall stems. Aspen daisy grows wild in dry grasslands and mountain regions and prefers full sun or partial shade. It tolerates most soils, as long as good drainage is provided and rarely requires water. Remove spent blooms to encourage more flowers.